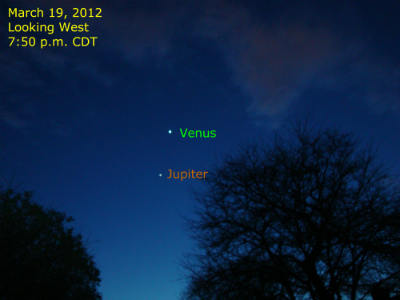 The planetary pair, Venus and Jupiter, continue to separate. This view was from my backyard in the Chicago area at 7:50 p.m. CDT. Look at the pair each evening at the same time. Notice how to pair separates. Take note of the appearances of the pair and the moon next week in our monthly update.